Web Globalization Report Card recognizes leading global websites including Google, NIVEA, Microsoft, and IKEA. Ashland, OR, February 14, 2019 --(PR.com)-- For the second year in a row, Wikipedia was named the best global website, according to the 15th edition of the Web Globalization Report Card, followed by Google. For 2019, Byte Level Research studied 150 websites across 15 industry categories — 80% of the Interbrand Best Global Brands. Websites were graded according to languages supported, global navigation, global and mobile website architecture, and localization. - The average number of languages supported by the top 25 websites is 60 languages, which is nearly twice the average number of languages supported by all 150 websites. - Volvo emerged as the best global automotive website. Uber joined the top 25 list for the first time this year. Also new to the list is GoDaddy. - IKEA remains the world’s most global retail website, though Amazon continues to make inroads. - NIVEA provides an excellent example of a company that localizes its models for local websites — one of the few companies to do so. - Emirates is the highest-ranking airline website this year, thanks in part to a new web design and improved navigation. - Enterprise technology companies such as Cisco Systems, Siemens, and Intel continued to demonstrate leadership in languages and global consistency, as well as increasing degrees of investment in localization. - The average number of languages supported by all 150 global brands is 32. To learn more, please visit www.bytelevel.com. Founded in 2000, Byte Level Research was the first company devoted to the art and science of web globalization. Byte Level Research benchmarks websites and mobile apps based on their global effectiveness — including languages, depth of local content, global consistency, and usability. 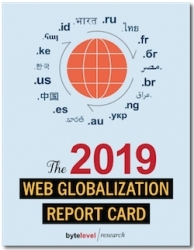 The 2019 Web Globalization Report Card is the 15th edition of this report. At more than 500 pages, the report includes a wealth of analysis and recommendations. Companies do not pay to be included in the Report Card, and all research is conducted by John Yunker; no work is outsourced. Companies that have purchased the Report Card over the years include Adobe, Cisco, FedEx, Sony, and Panasonic. Some companies have purchased the report for more than a decade, relying on it for both insights into emerging trends and a means of benchmarking their progress. John Yunker, co-founder of Byte Level Research, is the author of the books Beyond Borders: Web Globalization Strategies and Think Outside the Country: A Guide to Going Global and Succeeding in the Translation Economy (also available in Japanese).